Note: Since WP Rocket 2.8.11, if you're using our NGINX configuration, you don't have to do anything. When you access a page on desktop first, the desktop cache will afterwards be served to mobile devices as well—incorrectly, as WP Rocket should create a dedicated mobile cache file and serve it to small screens. When you access a page on a mobile device first, the correct mobile version will be cached and served to mobile later, whereas on your desktop you will see the correct desktop version afterwards. The cause of this misbehavior is that WP Rocket cannot remove specific rewrite rules automatically to enable mobile detection on NGINX as it would do on an Apache server. In order to solve the issue, you will have to edit your NGINX configuration. set $rocket_bypass 0;    # Should NGINX bypass WordPress and call cache file directly? This is basically what WP Rocket does for Apache, just translated to NGINX. 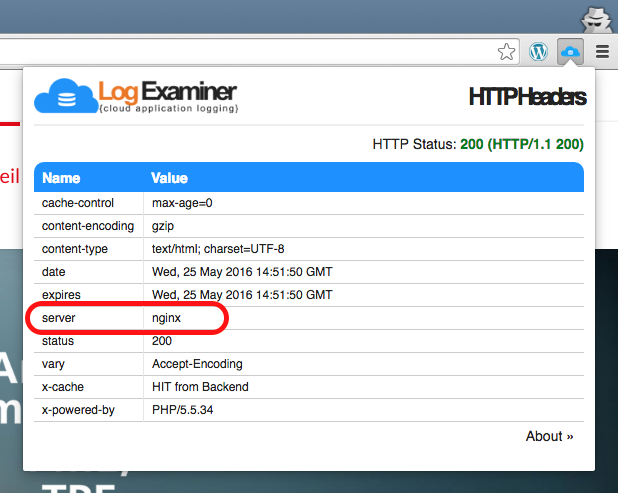 Tip: You can use a simple Chrome extension to determine whether or not your site is hosted on NGINX.